For those gamers not in the know, Nightfall is the new horror-themed,“direct conflict” deck-building game from AEG that feels a bit like the love child of Dominion, Magic: The Gathering and the old, classic Killer Instinct video game. Just as in Dominion, each player starts the game with a small collection of cards in their personal decks and can later augment those decks by drafting cards from stacks of other cards during their turn. Unlike Dominion, players are able – through the use of carefully played orders and minions – to deal direct damage to their opponents, sending wound cards into the opposing decks. The overall goal of Nightfall is to take as few wounds as possible (not an easy feat) and be the least bloodied badass when the dust has settled. 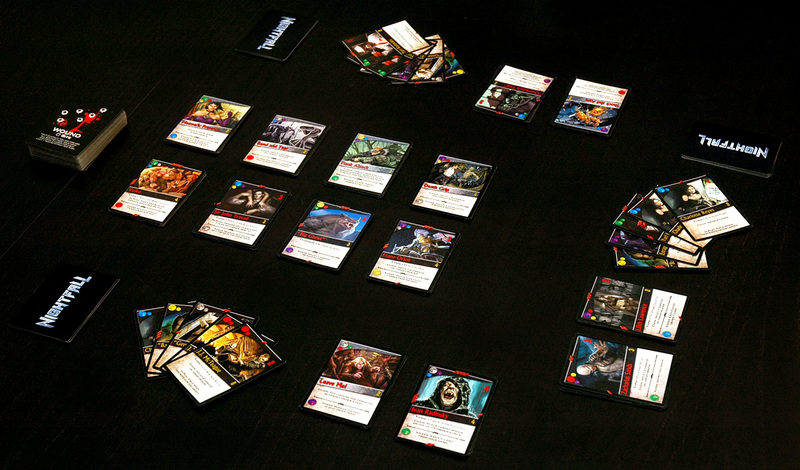 At the beginning of the game, each player receives the same two copies of six starter cards to form their main deck. Players are then dealt four “draft” cards from the main supply, choosing one to keep and passing the rest to the player on the left. Players then choose another card, and pass again. These two chosen cards will become the player’s private archives, and only they can draft cards from this area. The players then choose one of the remaining two cards to place in the middle of the playing area. This will form the commons where any player may draft. The remaining draft card is discarded. The commons are then filled with draft cards until there are eight total drafting possibilities. The draft cards are then replaced with full draft stacks and play begins. COMBAT – At the beginning of every player’s turn, all of their minions in play must attack. Players decide which minion is attacking each player. The defending player may use minions they have in play to block attacks, but any leftover damage not blocked by a minion is taken by the player, who places the appropriate amount of wound cards into their discard piles. At the end of combat, the active player must remove all minions from play (with the exception of a few special cards which do not discard after combat). Kickers add extra effects when the chaining moons are just right. 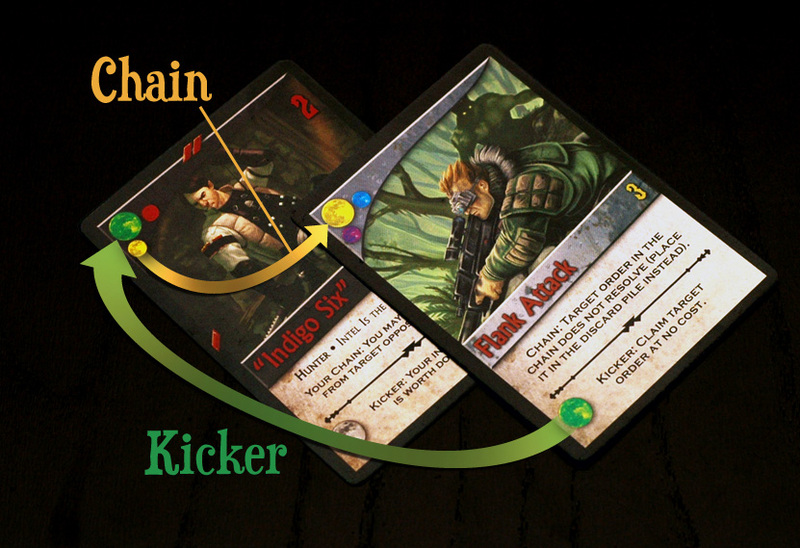 CHAIN – This is the trickiest part of the game, and the game’s core mechanic. The active player begins a chain by playing a card from their hand on the table, and can then link other cards to that card depending on the color of the moons in the card corner. If the color of the large moon on any other card in the player’s hand matches a color of the smaller, secondary moon(s) on the main card, the player may then play that card, as well. Chaining continues until the player chooses not to chain, or has no more chains in hand. The player to the left of the active player can then add to the chain, playing any cards that match the secondary moons of the last card in the previous player’s chain. After all players have had a chance to place cards in the chain, the chain is resolved, beginning with the last card played by the last player and proceeding backwards. This is how all actions are resolved and also how players can bring new minions into play to attack and block damage. CLAIM – In order to customize and build their decks, players need to spend influence to “buy” new cards. Every turn, the active player gets two influence points to spend. 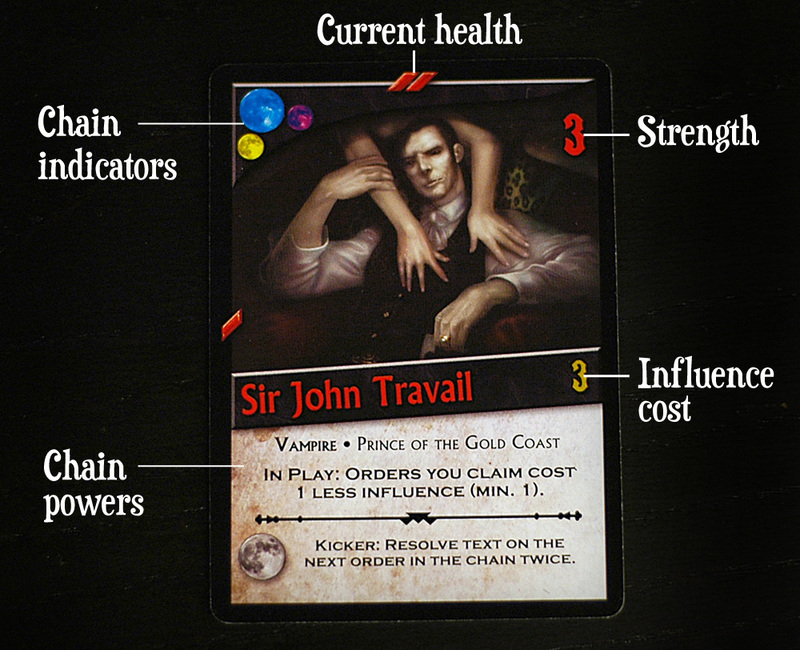 The number of influence points can also be increased through certain card resolutions in the chain phase. Players may also discard any card from their hand for one influence point each. All new cards are placed into the player’s discard pile. CLEANUP – The active player draws cards from their draw deck to fill their hands to five cards. If any of the cards in hand after drawing are wound cards, these can be discarded in order to draw more cards. Ultimately wounds are bad, but they can be beneficial during the game to draw more cards, and more cards means more opportunities to chain! Since each player starts the game with the same 12 core cards, the main strategy in Nightfall lies in intelligent card drafting, paying special attention to the primary and secondary moon colors. This can be the difference in building effective chains which will lay waste to your opponents and provide crucial blockers. If you can’t chain in this game, you’re dead meat. However, that said, players shouldn’t always just chain whenever they can – knowing when to chain effectively often requires patience and prudence. In a recent game, one player chained almost every card in hand during opponents’ turns, leaving him with no way to gain influence and draft more powerful cards. This also meant he was usually the one with several menacing minions on the table, which typically paint a very large target for immediate abuse by the other players. Also important to note is that combat is fast, furious, and mandatory, so Nightfall is not for the weak-hearted or thin-skinned. This game can be brutal, and diplomacy can often be a bitter pill to swallow. It’s hard to convince someone not to attack you when you just threw a werewolf the size of a bus at them for five wounds. The key is to find just the right balance of spreading the damage around so as not to be the one attracting the most attention at the table. This can sometimes mean saving a minion for just the right moment and taking a couple of wounds. For the most part, Nightfall is a quick, mostly-enjoyable, albeit savage, affair. The rules are very easy to pick up, and beginning players can typically hold their own at the table after they get the knack of drafting and chaining. Player reaction has been mixed, however – some love the brutality and the chaining mechanism, while others have said they prefer the more calm and relaxed Dominion and Thunderstone. Personally, I would rather order around a horde of undead and lycanthropic minions, ready to break some heads and chomp some necks, than take a leisurely stroll down to the town market- but that’s just me. As enjoyable as Nightfall has been to play, it does have its flaws. The biggest of these – and also the most subjective – is the theme. The universe that AEG has created for Nightfall is fantastic, and the storyline that Kenneth Hite weaves in the rulebook is awesome. However, I find it difficult to reconcile the theme and create a story as the game is played. Almost every minion in the game has a specific name, not a title, so when multiple copies of the same minion are in play, it creates a bit of thematic discord. There are plenty of times when “Bad Smoke” will be blocking for everyone, and you’ll send a couple of J.J. MacTeagues in to pummel a player. This problem is not as evident in games like Dominion, which gives generic titles to a card like “Market” or “Library.” Admittedly, Dominion’s theme is far weaker than that of Nightfall, but the point still stands. Another aspect of Nightfall I wasn’t entirely happy with also relates to theme. In the universe that AEG is creating, all the creatures of the night sometimes work together, even with human allies, to fulfill a certain agenda. Now, being an old school horror buff and horror gamer, there have been many an occasion when I’ve commanded a lycan pack or hunted down some bloodsuckers as a human hunter. As it stands right now, the creation of unified factions is impossible under the structure of draft, and in the numbers of cards. Vampires outnumber werewolves and humans almost 3 to 1, so creating a competitive deck that doesn’t include vampires isn’t feasible. A whole six pack of bloodsucking trouble. One final note on flaws outside of theme is in player drafting disparity in a large multiplayer game. In a game with the full five players, there is often a good chance that a particular card in the commons will be fully drafted by the time the fifth player’s turn begins. This happened in a recent game; I sent the hulking vampire Vulko to the commons so that I could develop successful chains with my private archives. I ended up being the last player to take a turn, and by that fifth turn, there was a table run on Vulkos and I was unable to draft. I was left with a hobbled chain selection for most of the game, not to mention a lack of any significantly-sized minions with which to block the hordes of Vulkos storming at me from four sides. For the most part, I can agree and see Todd’s stance on the flaws I mentioned. There is still a part of the purist in me that will be a bit put off by the inability to dominate the game with only lycanthropic shapeshifters (power to the pack!) but the game leaves plenty of room for house rules and variants to change all that (not to mention the coming expansions). As for multiplayer disparity, I would say that, although the game can handle up to five players, this is probably one best played with a smaller group. The sweet spot seems to be around three players – enough to prevent the complete head-to-head slugfest of a two-player affair, but small enough that no one will get ganged up on when there’s blood in the water. Overall, gameplay is smooth and fairly easy to grasp once the chaining mechanic starts to make sense. Because every player has the opportunity to make a play during the chain phase, there’s not much down time, which is good for those with short attention spans. The aforementioned player disparity in multiplayer games is the only downside to gameplay, but that can be combatted with smaller play groups. Replay is extremely high since the setup for every game is different - players will need to remain flexible and learn new chain combos from play to play because of the beginning draft mechanics. The art is fantastic, and card stock is of great, sturdy quality, which will hold up well to the constant handling and shuffling of any deck building game. However, since the cards are printed with black borders and black backing, nicks will show readily, so purists may want to invest in some quality card sleeves. 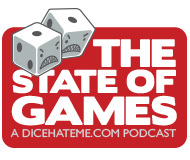 The overall theme is rich and engaging, and other than the nitpicks mentioned above, is well done, particularly the story and flavor provided by Kenneth Hite in the rulebook. Yes, Nightfall is fun, but only if you like the idea of pummeling your opponent into submission and then taking your fair share of lumps in return. With the right opponent or group, it can be a boisterous and spirited romp. It’s rare to see a Nightfall game where opponents aren’t trading good-hearted jabs and trash talk while some werewolf lays the smackdown on some dumb-witted fangers. To me, this is my kind of fun - not the hushed, library-like quietus of a game like Dominion. Overall score: 15 out of 18 - Not sure if it's a Dominion killer, but for a welcome change, I'd recommend this thriller. 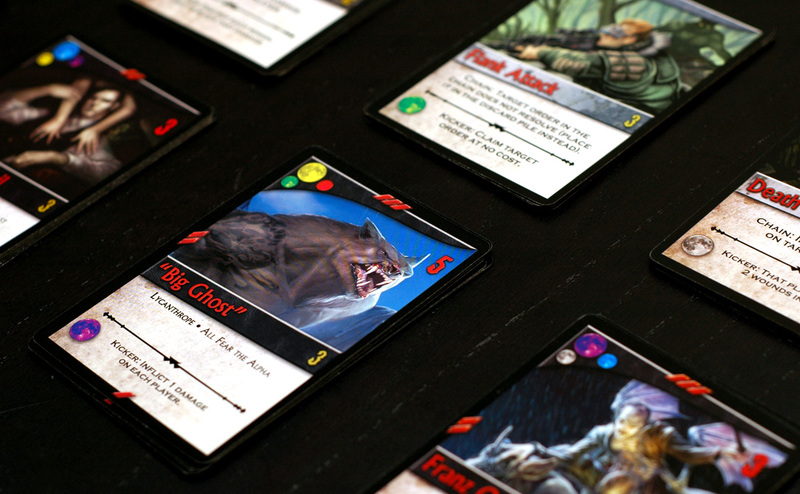 Nightfall is a game for 2-5 fiends, ages 12 and up, from Alderac Entertainment Group – home of some of the finest card games on the planet. You can purchase Nightfall from Funagain Games for $31.99, or from your favorite local game store.